This month is all about Gratitude! My American friends celebrate their Thanksgiving and many are expressing their gratitude throughout the month. So as it is the first Monday of the month the Designer Crafts Connection is hopping with Thank you gifts as the theme. As a sewer and someone who has worked with felt and fabric constantly, I am very grateful for my Big Shot and Sizzix dies where I can cut out many pieces quickly. I love the dress form die. 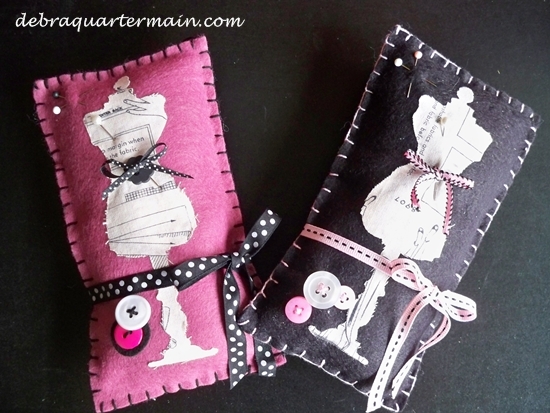 These pin cushions are just two rectangle pieces of felt embellished with the dress form, buttons and ribbon. Quick and easy and a gift I often give as a thank you. I will be making some in Holiday colors as they will also make a cute tree ornament for sewer and quilter friends. Gratitude, this month my heart is filled, I am getting married to a darling man, I celebrate a milestone birthday and this is the month my darling daughter finally arrived, a precious bundle at thirteen days old. Life is such a gift. So share in the season of the gifts of gratitude, follow the DCC blog hop with the button in the sidebar. 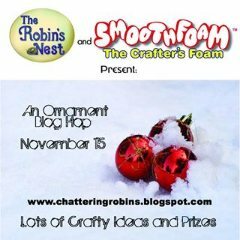 Check out on the Smoothfoam blog the Handmade Holidays blog hop and the awesome giveaway which ends today! Coming up on the 15th more Holiday creativity! We hop again with Smoothfoam and The Robin's Nest! Such a lovely gift! Easy to make and useful too! Thanks Michelle, die cuts make it so quick and easy!